The focal point of this Irish costume jewelry bracelet is the center Celtic knot bead that measures 5/8" wide. This silver tone Celtic costume bracelet has alternating metal and green and white glass beads. The beads on this Celtic knot costume bracelet are strung on elastic so it will accommodate most women's wrists. 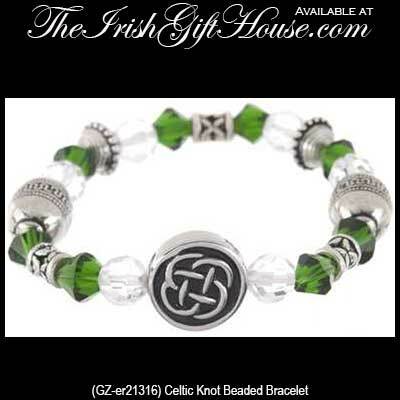 This Irish costume jewelry bracelet is gift boxed with a Celtic knot history card; complements of The Irish Gift House.